Troll, troll, troll your... pontoon? Apex has started building a center console pontoon boat, designed and constructed for serious saltwater use. You’re looking at the Apex Angler Qwest, which comes in 18′, 20′, 22′, and 24′ models. Not only does it come with the bazillion rodholders you can see here, the rest of the boat is thoroughly tweaked-out for fishing. The console is molded fiberglass, and has plenty of room for electronics. There are six tackle stowage boxes built into the leaning post plus a pliers/knife/rig holder. The aft center fishing station houses a 22-gallon livewell, tackle trays, and a rigging station. And the decking and fencing consists of diamond-plate non-skid aluminum and rugged vinyls. 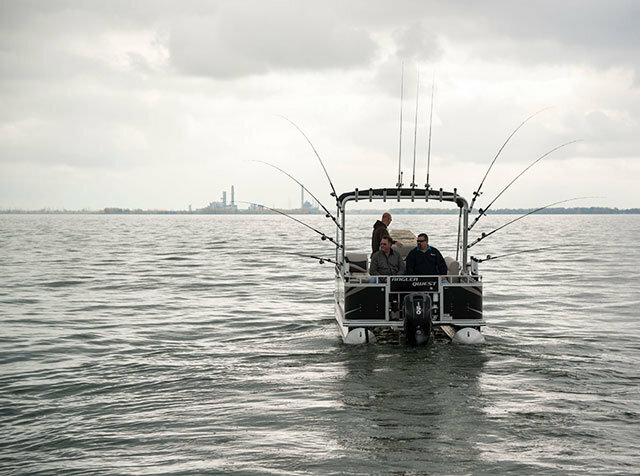 From bow to stern, the boat is blood-and-guts tough; forget about the poofy carpet, loungers, and wet-bars you’ll find on the average pontoon. One exception, if you so desire: if you have family and friends who like to relax while you cast, the Apex can be ordered in “trolling” versions which have loungers in the bow. Beyond the fishy features, this pontoon is more or less like the rest of the field. Pontoons are 0.8″ and 0.9″ thick aluminum, in 23″ diameter. The sub-decking is marine-grade, rot-free plywood. And cross-channels are extruded 6063 T6 aluminum, set on 24″ centers. Troll, troll, troll your… pontoon? So, just how well does it perform as a fishing machine? Just look at those pictures once more. I dare say you can get more trolling lines out than you can with a comparably-sized monohull, and there’s no doubt this will make a stable casting platform. The only down-sides will be the reduced ability to take on big seas, and less thrilling performance than a monohull can provide. 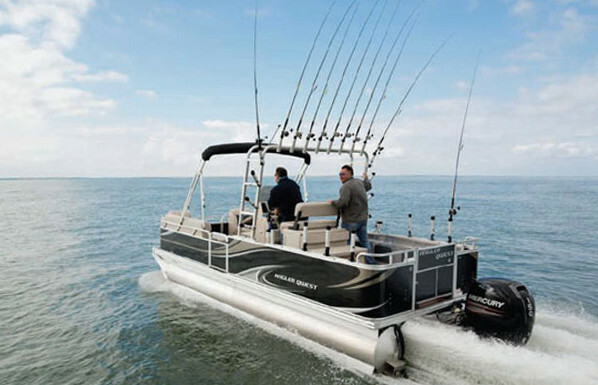 And considering all the pontoon advantages, that means the Apex is a serious contender for a huge number of anglers.